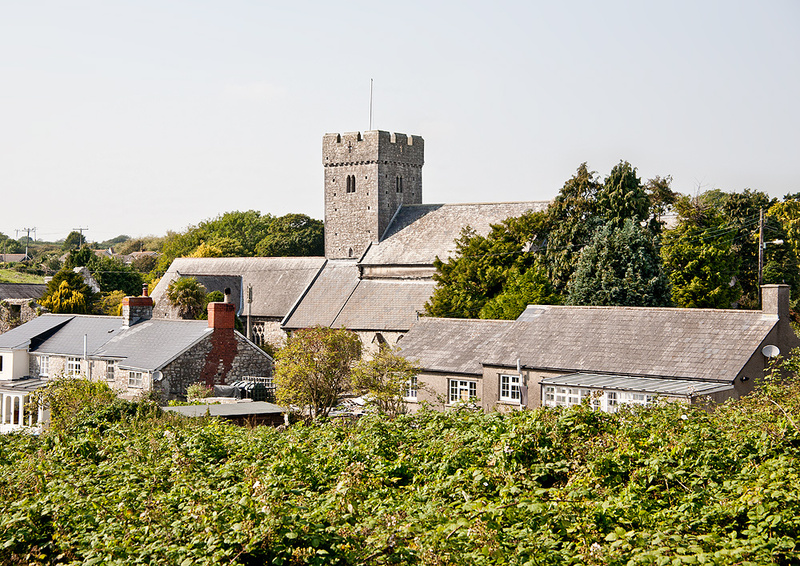 The Parish Church of Llantwit Major is sited in a hollow in rural surroundings on the western edge of the town. The church is dedicated to the name of Illtud, a charismatic and learned Christian teacher who lived here and founded a monastic college here at the beginning of the 6th century. For the history of the present building and its subsequent development we have to start with the Norman occupation of Wales. 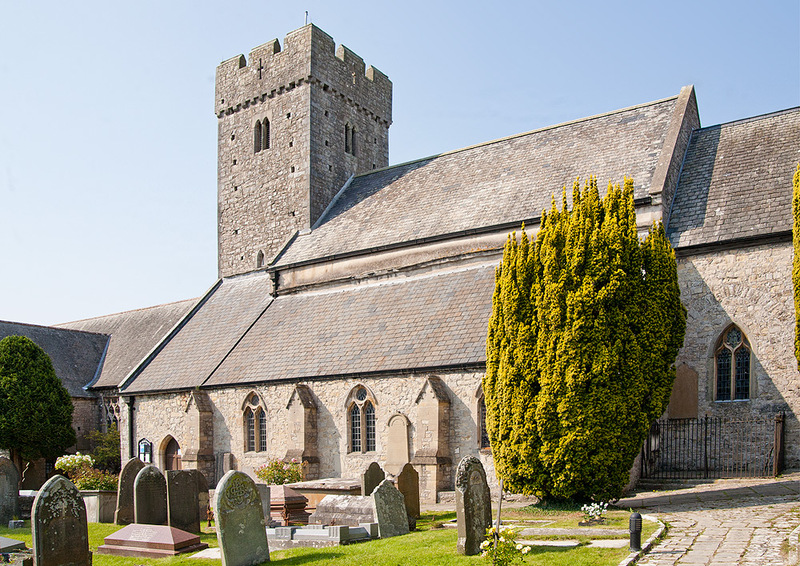 The tithes of the rich lands of Llantwit Major were seized by Robert Fitzhamon, the Lord of Glamorgan, and vested in the newly formed Abbey of Tewkesbury. The first Norman structure was a simple cruciform building without a tower. There is considerable evidence that this was built on the foundations of an earlier church which might date from Illtud’s period. The 13th century saw the addition of a low tower at the eastern end of the church. 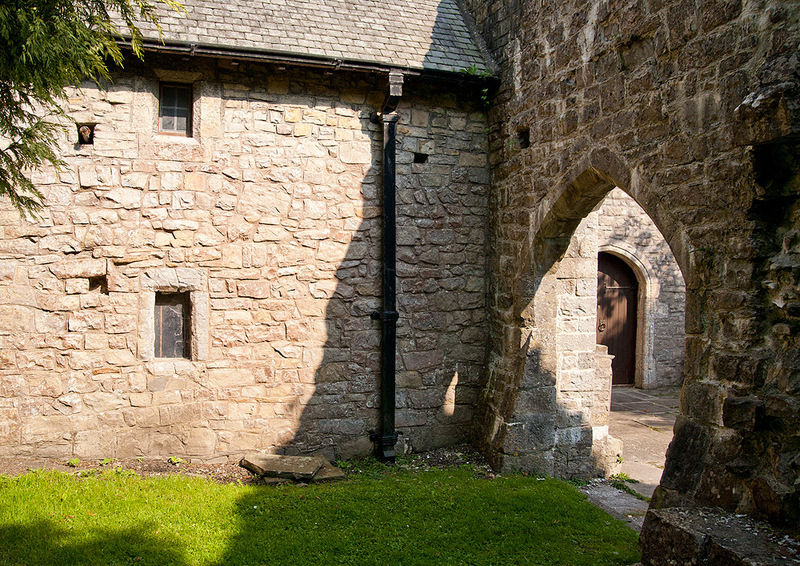 Later in the century an extensive grange or farm was established on land immediately to the west of the church, and it was to provide for the daily prayers and offices of this community that the East church was constructed abutting the tower. The West (old) church remained as the parish church. Around 1400 the East (monastic) church was extended with side aisles and the raising of both roof and tower to their present height. An extension of the West church to the west (the Galilee chapel) dates from this time. It is known to have been endowed as a Chantry by a member of the Raglande family (c.1500) but has been in its present ruined state for several centuries. A chantry priest’s house (badly damaged by a German bomb in August 1940) stands on the south side of the churchyard. The west church itself was largely restored in the 14th century with the reconstruction of the upper walls of the South porch (with its parvise above) and the collar beam Irish oak roof as it stands today. The dissolution of the monasteries would have seen a decline in the medieval grange and with it a change in use of the monastic (eastern) church, which became adopted as the parish church. The dissolution and the later Puritan period had a marked effect on the interior appearance of both east and west churches with the destruction of much of their ornamentation and statuary. The west church was particularly neglected until a major restoration in the early years of the last century. In the eastern church the principal features of interest are the wall paintings:- the Royal Standard of King James 1604, St. Christopher (c.1400) and those of Mary Magdalene and the Virgin Mary on the walls of the Chancel. In the southeast corner of the nave are the sculptured Jesse Niche and the restored Altar Slab (mensa) with its fascinating history. Architectural features include squints (hagioscopes), stone benches, a carved stone reredos and roof level markings on the tower, which tell the story of the development of the east church. Various memorial tablets around the walls and in the floor offer an endless source of interest to visitors. The organ, donated to the church more than a century ago was once played in concert by the composer Gabriel Faurê. The west church is still used for regular worship despite having become a depository for many unrelated historical artefacts. Most notable are the 9th century standing stones and Celtic crosses which stood on the site before the present buildings were constructed. A full interpretation of their inscriptions is included in the church guide. Here too several stone effigies have found a resting place while an abundance of memorial tablets chronicle the histories of prominent local families. The church has strong links with Brittany, where a number of churches are dedicated to Illtud. Visitors from all over the world have been rewarded by spending a few moments in this oasis of tranquillity with its atmosphere of timeless continuity. The church is open on most days and all are welcome.